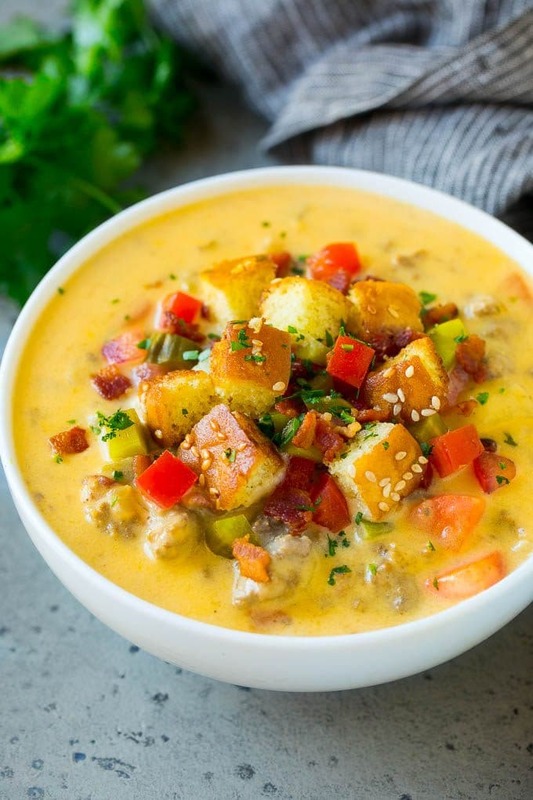 This cheeseburger soup is a creamy blend of ground beef, bacon, potatoes, vegetables and cheese, all finished off with your favorite burger toppings. A hearty dinner option that’s popular with both kids and adults alike! When it’s cold outside, soup is on our dinner menu. Some of my favorites include cabbage roll soup, stuffed pepper soup and this super delicious cheeseburger soup. 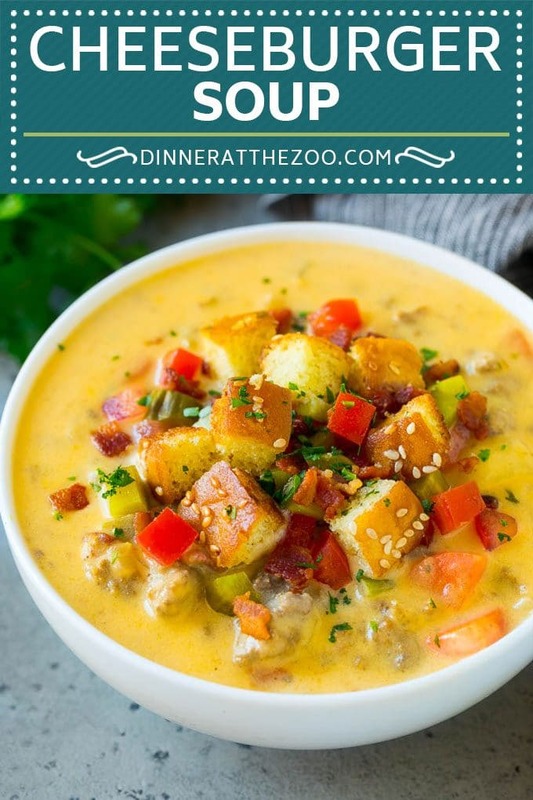 This cheeseburger soup is comfort food at its finest – it really does taste like a loaded cheeseburger, all in the form of a hot bowl of soup! This soup is loaded with meat, veggies and potatoes and is sure to satisfy even the heartiest appetites. How do you make cheeseburger soup? This recipe starts with bacon, which gets cooked until crisp and then is reserved for later use. Carrots, onion, celery and garlic are cooked in the remaining bacon fat, then cooked ground beef and potatoes go into the pot. Everything simmers together with chicken broth until the potatoes are tender. The soup is made rich and creamy with the addition of milk and cubes of cheese. Finish off the soup with burger toppings such as bacon, tomatoes, pickles and bun croutons, then dinner is served! 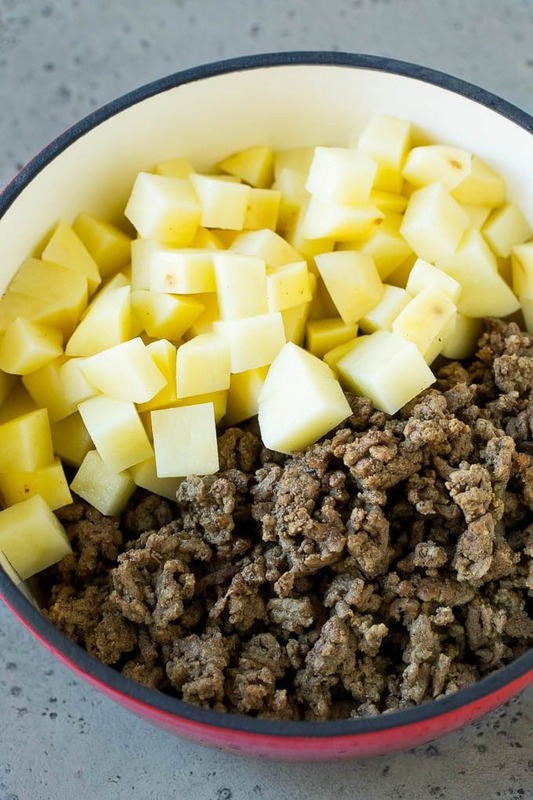 I typically use 90% lean ground beef – it’s got plenty of flavor but is not overly greasy. If you use meat with a higher fat content, be sure to drain off any excess grease before proceeding with the rest of the recipe. This recipe calls for Velveeta cheese, because it produces the creamiest end result. You can substitute shredded cheddar cheese if you’re opposed to using Velveeta, but I urge you to give the Velveeta a try because the texture is so much better in the finished soup. I use Russet potatoes in this soup, but yellow potatoes or red potatoes will also work if that’s what you have on hand. This soup makes great leftovers! It will keep in the fridge for up to 4 days. I don’t recommend freezing this soup because it contains dairy, and dairy products can sometimes separate when frozen. To make the bun croutons, you can cube up sesame buns and either cook them for a minute or two in a toaster oven, or cook them with a little butter in a skillet until golden brown. 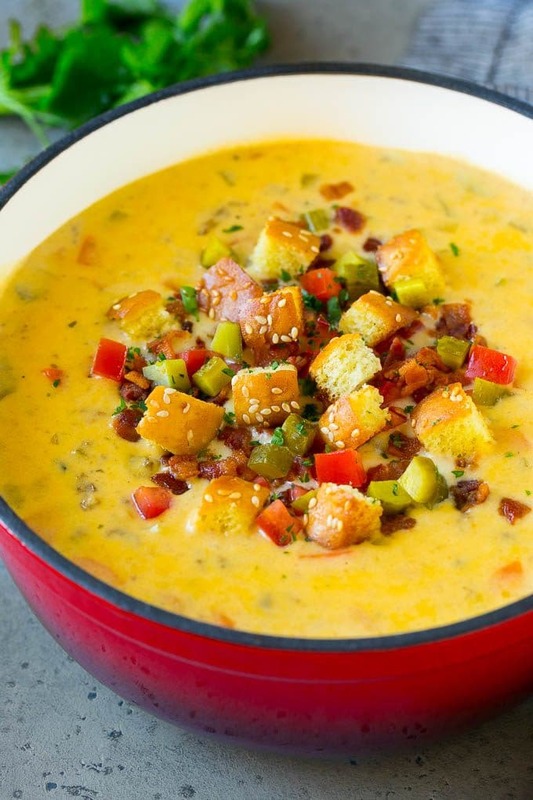 There are so many different ways to customize this soup to make it your own! Protein: Instead of ground beef, you can try using ground turkey or even mild Italian sausage for a different flavor. Vegetables: You can add other vegetables that you might find on a cheeseburger such as mushrooms, or even bell peppers. Spice: Like spicy food? You can add hot sauce to taste, or a pinch of crushed red pepper flakes to the soup. Another option would be to stir in a cup of shredded pepper jack cheese along with the Velveeta. This is one of my most requested soup recipes, I actually think it might even taste better than an actual cheeseburger! The soup is rich, creamy and loaded with different flavors and textures. This is definitely a must-try! 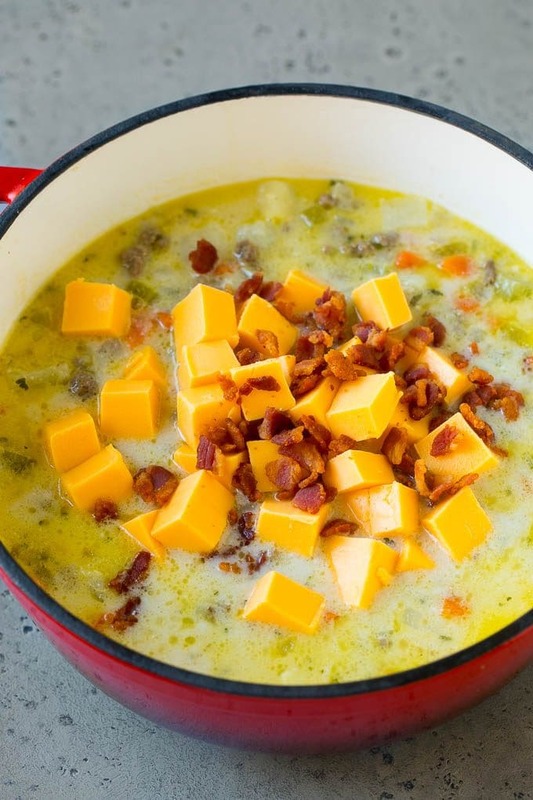 This cheeseburger soup is a creamy blend of ground beef, bacon, potatoes, vegetables and cheese, all finished off with your favorite burger toppings. A hearty dinner option that's popular with both kids and adults alike! Place a large pot over medium heat. Add the ground beef and cook, breaking up the meat with a spoon, for 5-6 minutes or until the beef is no longer pink. Season to taste with salt and pepper. Remove the meat from the pot and set aside. Add the bacon to the pot and cook for 5-6 minutes or until crisp. Set the cooked bacon aside. Drain most of the bacon grease from the pot, leaving 1-2 teaspoons in the pot. Add the onion, carrots and celery to the pot. 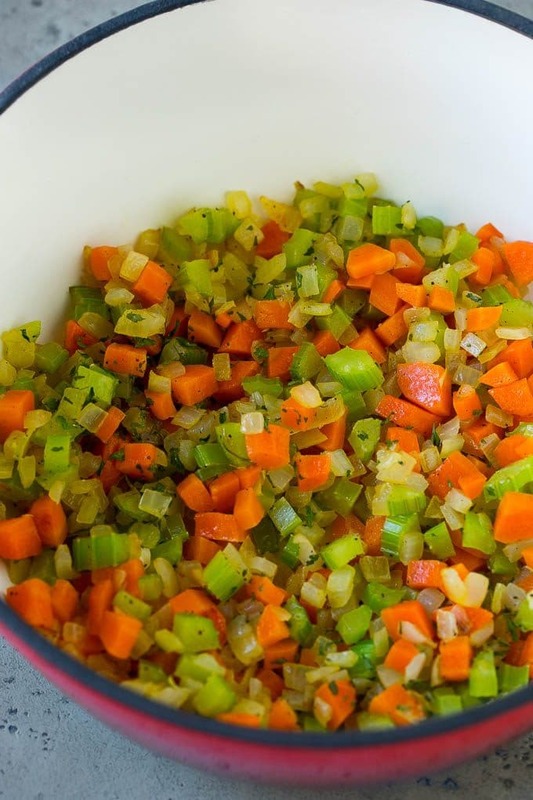 Cook for 3-4 minutes or until vegetables are just softened. Add the dried parsley and garlic and cook for 30 more seconds. Add the ground beef back to the pot, along with the potatoes and chicken broth. Bring to a simmer and cook for 15 minutes or until potatoes are tender. While the soup is simmering, melt the butter in a small pan. Whisk in the flour and cook for 1-2 minutes or until bubbly and thickened. After the potatoes are tender, add the flour mixture to the soup and bring to a boil. Cook for 2 minutes, stirring occasionally. Add the milk to the pot, then stir well to combine. Add the Velveeta cheese and reserved bacon to the soup. Cook for 3-4 minutes or until cheese has melted. 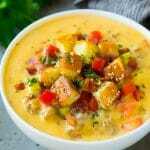 Serve the soup with assorted toppings such as hamburger bun croutons, tomatoes, pickles and more bacon. Directions for the hamburger bun croutons are in the post under the tips section. This looks amazing! Do you think you could do this in the crockpot? I think that would work fine!